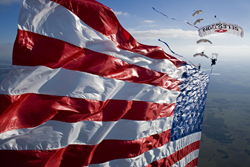 Sunday, June 7th, 2015 Team Fastrax™ will be performing a patriotic American Flag Skydive at the opening ceremony of the Axalta “We Paint Winners” 400. The race is being held at the Pocono Raceway in Long Pond, PA.
We are honored to be performing our patriotic American Flag skydive at such a thrilling event. The Axalta “We Paint Winners” 400 NASCAR Sprint Cup Series race is held at the Pocono Raceway in Long Pond, PA. Sunday, June 7th, defending race winner, Dale Earnhardt Jr. and all of the stars of the NASCAR Sprint Cup Series will battle it out for the checkered flag. As part of the opening ceremony, Team Fastrax™ will be performing their fan favorite, patriotic American Flag Demonstration jump, along with red, white and blue streamers and smoke. According to the raceway website, Pocono is in the Magic Triangle – New York, Philadelphia and Pocono Raceway are all 90 miles away from each other – with New York as the #1 TV market and Philadelphia as the #4 TV market. Pocono is within 200 miles of 60 million people and when you consider that the average NASCAR Sprint Cup fan travels 300 miles, they are in the highest population density of any other Sprint Cup track. Their unusual triangular configuration is conducive to many lead changes especially with the longest straightaway and the widest main straight with the longest and widest Pit Road. All of these features give Pocono uniqueness – a very enjoyable difference. Team Fastrax™ is sponsored by Selection.com®, a leading provider of criminal background checks and pre-employment screening services. Team Fastrax™ is the most ambitious professional skydiving team in the world. The parachute demonstration team has a roster of more than twenty-nine active members, with a collective of more than 300,000 skydives. Team Fastrax™ has performed exhibition skydives all over the world for audiences large and small as a patriotic display or as a product promotion. For more information on the race, or to purchase tickets visit the Pocono Raceway website. For questions or for an interview, contact Gene Newsom with Team Fastrax™ at 513-422-5867.